The Staff at Upper Perk Physical Therapy would like to thank all of our patients, fitness members, physicians, and business partners for helping us to be voted Best Physical Therapists in Pennsburg. It is our great pleasure to receive this honor in the recognition for the effort we make in providing physical therapy services for our community. Thank you! 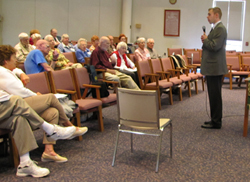 This past October, I had the opportunity to guest lecture at the Peter Becker Community. 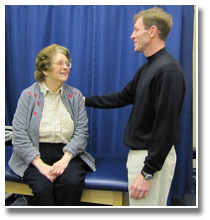 The topic of discussion was the advantage of therapeutic exercise in Parkinson’s Disease (PD). The Peter Becker Community Parkinson’s Disease support group meets monthly for lectures and small group meetings for consult and discussions related to PD. I was pleasantly surprised by the large attendance and each participant’s willingness to be proactive in managing their limitations and impairments. Our session included an interactive discussion on the frequency and form of physical exercise performed, overview of medications, and conversing why functional mobility such as the sit to stand transitions and turning in enclosed spacing are commonly impaired. I was able to help problem solve both general and specific concerns of most participants by recommending specific exercises, and compensatory techniques. The group was encouraged to share their experiences, and they enthusiastically expressed their knowledge. I will gladly capitalize on the opportunity to return to Peter Becker, and assist our community to succeed as fellow support members, human beings, and role models. We are in the midst of our own version of the Biggest Loser contest. First a little background. We started this program in January 2010. At first my wife Jeanette didn't like the title "Biggest Loser" contest. She wanted to name it the "Biggest Winner" contest. I tended to agree but my staff pointed out that everybody is familiar with the title and I should just get over it. I did. The contest is going well, very well. So many people have had such great success. At the end of the contest, we will make a grand total of pounds lost and inches lost compiling the measurements from all of the participants. Some of the participants like Bill Odor have really made substantial changes in their body as well as lifestyle. The concept of the team idea also seems to have been a good one. People like being part of a team. Teams push each individual to be their best. Below you will see the photos of the team. Special thanks to Bob Peters for his help in this regard. Great work Bob! We also had the opportunity to have Dr. Sedicum give a talk on proper diet and nutrition. This was very informative and received well by all the participants. He offered too much information to share with everyone in this blog but for more information about how you can improve your diet and nutrition habits contact Dr. Sedicum at 215-529-7246. He is located at 240 S. West End Boulevard, Quakertown, PA 18951. Also check out his web site www.drfreshdiet.com. It will open your eyes. Click here to view the event photos. Also thanks to the Eagles Cheerleaders, Dana and Jenna, who visited with us and took some great photos. And of course a special thanks to all our customers! We appreciate your business and look forward to another great year. Click here to view the event photos.